The enigmatic Elysian Fields hit it hard in 1996 with their moody late-night atmospheric album "Bleed Your Ceddar", which was signed on the now defunct Universal Music Group's parent Radioactive Records. Since then, Jennifer Charles and Oren Bloedow, the couple behind the band, fell into some kind of general oblivion while recording more albums mostly released by European labels. The band's mysterious discretion is all the more puzzling considering the general high quality of their now seven full length LPs and excellent live shows (Their March 31st Brussels concert at Le Botanique was sold out). The oddly titled "For House Cats and Sea Fans" has been issued by French label Vicious Circle last February and it contains first an impressive list of guests. Besides mainstays like jazz pianist Ed Pastorini and drummer Mike Johnson (Jeff Buckley, Rufus Wainwright, Beth Orton), one can find cats like jazz bassist James Genus (Dave Douglas, Michael Brecker, Chick Corea, a.o. ), jazz drummer Ben Perowsky (from Dizzy Gillespie to Chris Speed), famous jazz keyboards player John Medeski, experimental artist J.G. Thirlwell of Foetus fame or even cult musician James Chance playing saxophone on "She Gets Down". Elysian Fields' Oren Bloedow is himself a pretty busy guitarist with several solo albums and multiple collaborations while Jennifer Charles appeared on "Music to Make Love to Your Old Lady By" Lovage, some John Zorn's records and even guest appearances on two French singer/songwriter Jean-Louis Murat's albums. The cover painting of "For House Cats and Sea Fans" has been created by John Lurie, mostly known as composer and jazz maverick sax player for The Lounge Lizards. Namedropping is hard to avoid with such well surrounded chaps. Now the music proposed by Elysian Fields remains rather unchanged throughout the years. On this last album they are indeed still delivering dark smoke-filled sometimes eerie but always stylish slightly jazzy dream rock, the focal point being the sensual almost lascivious voice of Jennifer Charles for sure but also the often original musical arrangements which offer much variation in textures and colors from song to song while keeping the whole album homogeneous. This seventh opus could pretty much be one of their best albums with "Queen of the Meadow" in 2000 and "Bum Raps and Love Taps" in 2005. 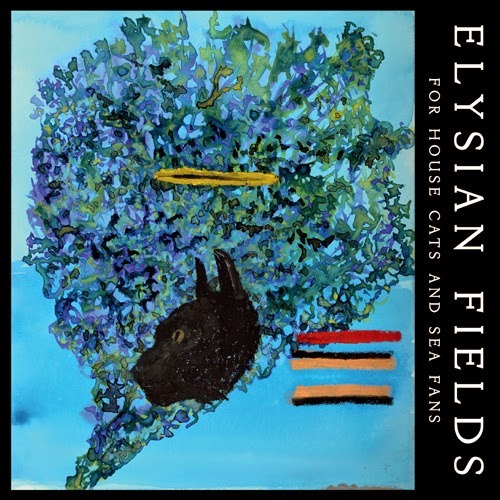 But enough blahblah, please stream "For House Cats and Sea Fans" below.